Unsightly speaker cables cause more domestic arguments than Jade Goody, but wireless 5.1 systems like this are making them a thing of the past. The SC-HT545W uses radio waves to beam surround audio signals to a receiver box connected to the rear speakers, which means that you don't have cables trailing across the room. The system may look attractive, but the rear panel is under-equipped. There are progressive scan-capable component video outputs and an RGB-capable Scart, but there's no HDMI socket and no digital audio input for external sources like Sky . We're also disappointed to discover that Dolby Pro Logic II can't be used with the stereo audio input. On the front is a Music Port, a 3.5mm audio input that allows you to listen to MP3 players through the system. 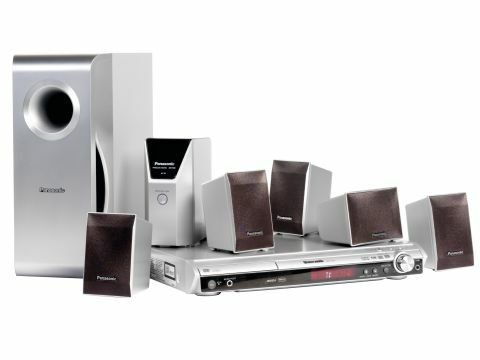 The system offers 660W total power output, DVD-Audio, MP3, WMA, DiVX and JPEG playback, plus a range of sound modes such as Dialogue Enhancer, which boosts the centre channel by 6dB for clearer movie speech. Picture quality from the component video output is excellent. Colours are warm and radiant, skin tones are natural and finely nuanced, while decent contrast and detail levels give the picture a great deal of depth and clarity. Shadows on large background areas are smoothly gradated and don't suffer from block noise, though there is an occasional touch of dotty noise. HDMI output and video upscaling would have been more than welcome, and it's not unreasonable to expect it at this price. As for audio quality, the system reproduces the frenetic action scenes in Kill Bill 2 with aplomb. The opening hand-to-hand combat scenes provides a scintillating showcase for the wireless rear channels; the surround effects being crisp, clear and well steered. The centre channel is also superb, with the Dialogue Enhancer offering strident speech reproduction even during the most energetic scenes. Keep the subwoofer set to levels one or two and it does a terrific job, injecting tight, punchy bass into the mix without overpowering the satellites. But at level 3 or 4 it gets a little wild and resonant, so for the best results you need to exercise a bit of restraint. The absence of some key connections is a disappointment, particularly HDMI, but from a performance perspective the SC-HT545W is impressive for the money and the wireless rears are a cable-cutting revelation.